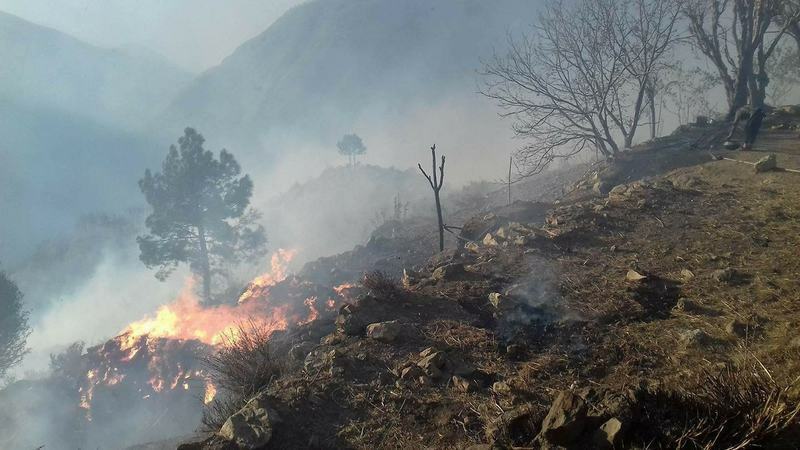 A massive blaze that gutted over 700 acres of forest in the Kormang Gandorai area of Shangla district, Khyber Pakhtunkhwa, for over three days has finally been put out by rescue and forestry teams. Divisonal Forest Officer (DFO) Shangla Muhammad Amjad told Dawn that the fire, which began on Thursday, had been extinguished by Sunday afternoon. Four villages were affected by the fire, he said. Muhammad Sadiq, a local resident, told Dawn earlier that a mosque, two water supply stations and some houses were also gutted in the fire. He said forest department personnel are attempting to contain the fire, but it seems out of their control. More than 200 workers of the forest department were engaged in efforts to contain the fire, DFO Khan had said earlier, alongside locals who were taking part in the rescue work. Forester Zahid Hussain visited the site where the fire is believed to have erupted and undertook efforts to identify the culprit who set fire to the bushes. Locals earlier claimed that the forests were set on fire by the land and timber mafia in connivance with the staffers of the departments concerned. The DFO earlier said the fire seems to have been “started deliberately”, but the department would properly investigate the issue. He added that a high-level inquiry would be conducted to find the reason of its occurrence. The fire broke out on Thursday evening in the Gandorai area adjoining the mountains of Bisham city, and the blaze spread rapidly because of heavy winds. Zahid Hussain, Sher Dil and their team were among those who put their lives at risk to extinguish the blaze.